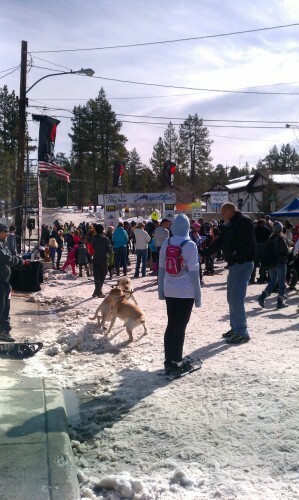 Last weekend marked the 6th Annual Snowshoe the Bear event in Big Bear Lake, CA. As expected, many Fawnskin Folks had entered or were working at the event. As you can see by this breaking news photo, Dave Emig (whose mention and photo are usually good for a beer) was totally immersed in his tasks. 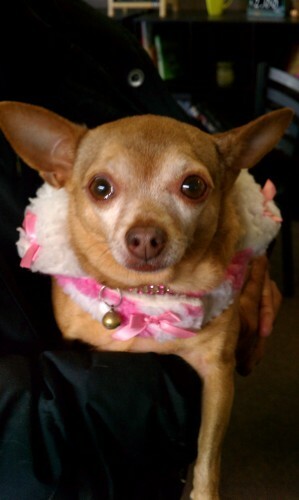 But there were some interesting bystanders such as this cute Fawnskin dog, Chispa. Who was pretty in pink but who did not compete. 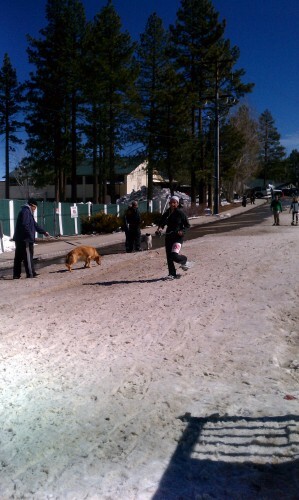 There were many dogs participating this year and GG was surprised at the light attendance since there was so much fresh, new fallen snow. But the good news was our infamous Guzman group placed well. 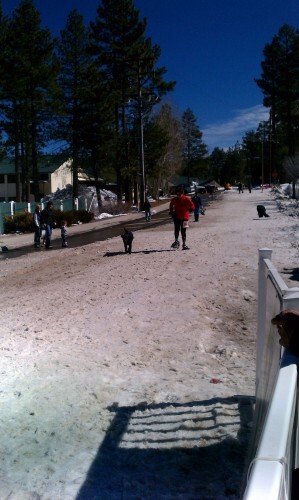 Hope was 4th in her age group and 18th over all. Emily placed 8th, Ociel placed 10th despite twisting his ankle, and Gwen placed 31st. 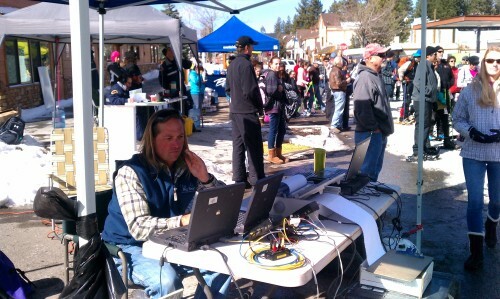 North Shore Trading Company was one of the vendors and it was good to see Jim and Janet. 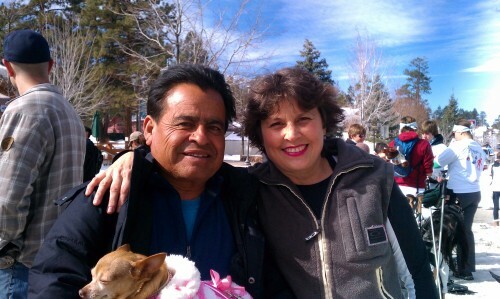 Local resident, Jordan Romero was there as a spectator and GG got him to pose with Jim Dooley to document the occasion. Kathy Harper was also in the line up but GG didn’t get a chance to get a snap. 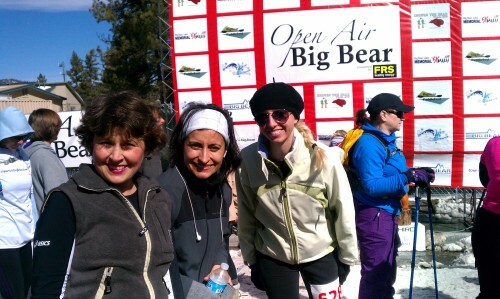 In case you missed it, the Guzmans’ made the news at the 2012 Snowshoe the Bear. They are always fun to be around and were well behaved at the after party. That is my news for today. Here are a few more “action” photos and I’ll be back with the TOT on Thursday. 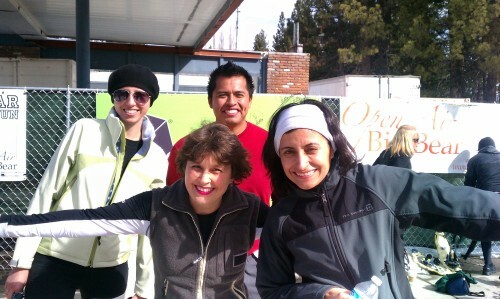 Hope Guzman officially finishing Snowshoe the Bear 2013. 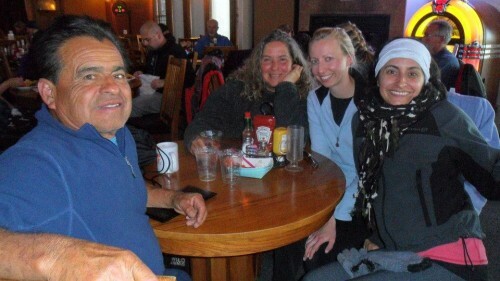 Some of the spectators and vendors at Snowshoe the Bear 2013. 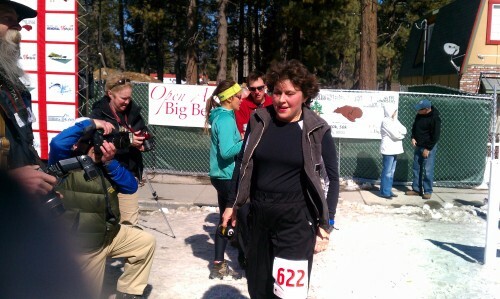 Gwen solidly places in the top 50% in Snowshoe the Bear 2013. Happy Fawnskin Folks, Nacho, Hope & Chispa! 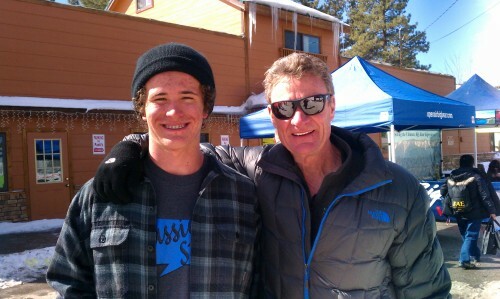 This entry was posted on Tuesday, February 26th, 2013 and is filed under Events, High Altitude Living, Small Town Living. Ahh! What a nice article! Thanks so much! Of course, it is always nice to see you! Thanks for the good time!